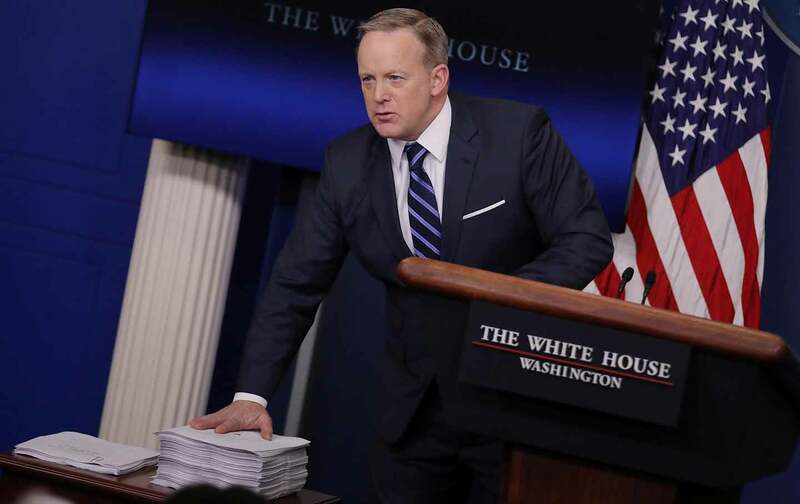 White House Press Secretary Sean Spicer appeared to be imitating Melissa McCarthy’s Saturday Night Live imitation of him when he tried to make the argument for replacing Obamacare with Trumpcare by placing a copy of the final version of the 974-page law next to the sketchy Republican substitute. Support for the Affordable Care Act has soared, as Americans say they want it expanded—not repealed. Needless to say, the Spicer “size” video went viral. The Spicer alternative fact that ought to be reported, and addressed, is a repetition of the spin that has been used by President Trump, Vice President Pence, and House Speaker Paul Ryan to peddle their latest scheme to redistribute wealth upward. “This is the Obamacare replacement plan that everyone has been asking for, the plan that the President ran on, and the plan that will ultimately save the system,” the White House press secretary announced in the takeaway quote of the day. To be clear, if Donald Trump “ran on” this plan, then it was not the choice of everyone. It was not the choice of the majority of voters. It was not the choice even of a plurality of voters. Fifty-four percent of American voters rejected Trump last November; his main opponent, Democrat Hillary Clinton, beat him by almost 3 million votes. The claim that everyone was asking for this plan, or even for a replacement of the Affordable Care Act, is an alternative fact. It’s fake news. It’s a lie. Survey research tells us that the popularity of the Affordable Care Act is rising. Rapidly. Polling numbers fluctuate. But here is the interesting twist: Surveys frequently show that, among those who favor altering the ACA, most want it to be made stronger—not weaker, as Trump, Pence, Ryan, and Spicer propose. Only 31 percent supported complete repeal. Why would Spicer peddle the fantasy that Americans called for the Republican plan, when that is clearly not the case? Maybe Spicer is lying because the truth is inconvenient. Maybe Spicer is lying to himself.